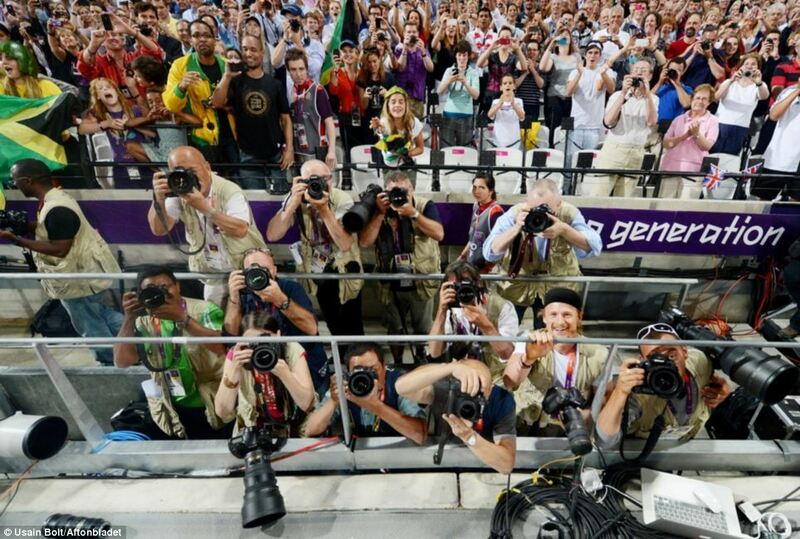 Usain Bolt Madness: Grabs Professional Photographer's Nikon D4 Camera and takes (Good) Pictures! - Haba Naija! Usain Bolt stormed home in 19.32, 2 milliseconds after is own record, and began to do press-ups infront of an asonished croud! Then, just moments after the Jamaican sprinting legend came fractionally behind his own record, Bolt charged past at least 4 Canon DSLR’s, and confirmed what N-Photo readers have always thought. He prefers Nikon to Canon! He grabbed Jimmy Wixtrom’s Nikon D4 camera, and started taking photos of his teammates, and the camera’s smiling owner!! Naturally, the photographer was all too happy to let Bolt run off with his camera! Surprisingly, for a sprinting legend, they were actually really good! Jimmy Wixtrom is a photographer for the main Swedish newspaper, Aftonbladet. You can view the video of the event here.